"A masterpiece of urban style combining fully waterproof and windproof/breathable GORE-TEX fabric with premium goose down and synthetic insulations. Sometimes the urban landscape requires alpine performance. Stylish, warm and stormproof, the Therme Parka delivers just that. 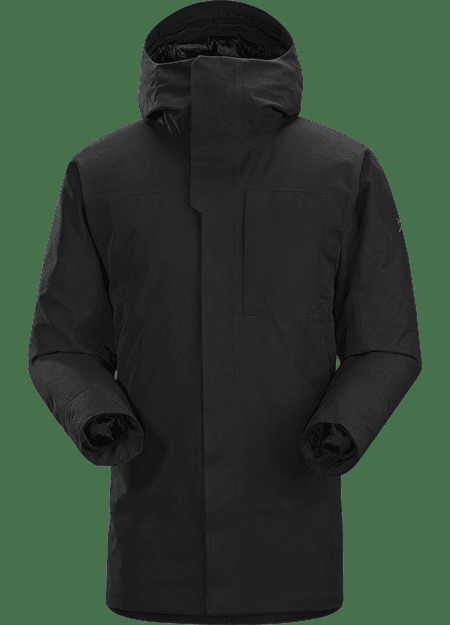 A truly waterproof/windproof GORE-TEX outer works with the premium goose down and advanced Coreloft synthetic insulation for warmth and weather protection on the harshest days. 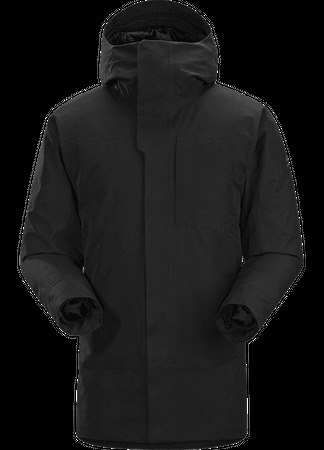 This is a traditional parka with a streamlined look and discreet pockets are thoughtful, logical and secure. GORE-TEX is proven to deliver longwearing, lightweight, waterproof/breathable protection. The Therme uses a P75d GORE-TEX 2L outer. The hand is soft and supple, and has a textured, cotton like face. Every seam is taped for maximum waterproofness, and the Coreloft insulated hood offers full protection with added warmth. 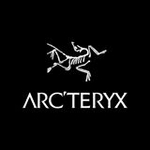 Efficiency breeds performance, so Arc�teryx leverages their Down Contour Construction and Down Composite Mapping technologies to place specific insulations where they provide the greatest benefit. Down Composite Mapping effectively places down and synthetic insulations where they deliver the most benefit. Lofty, high performance, 750 fill power European Goose down lines the core and sleeves where warmth is most needed. Because it retains warmth when wet, Coreloft synthetic insulation is used at the cuffs, hood and under the arms, areas prone to contact with moisture. Down Contour Construction allows the down to form to the body, delivering more efficient thermal performance with a trimmer, more streamlined fit. Fit: Regular Fit, Thigh length, Centre back length: 84 cm / 33 in "